Between work and this sinus crud I’ve been fighting, I finally got around to taking the girls to deposit their calf checks this week. Taking a friend’s advice, I told them they could each have $25 of it to spend however they wanted. Clothes, hairbows, markers, movies, candy, toys….whatever. This was an overwhelmingly delightful thought for both girls. And they started planning what they wanted, and where they wanted me to take them. I told them Friday afternoon was the day. They didn’t let me forget. So off we went, and OH THE DECISIONS. We spent a lot of time wandering the toy aisles. 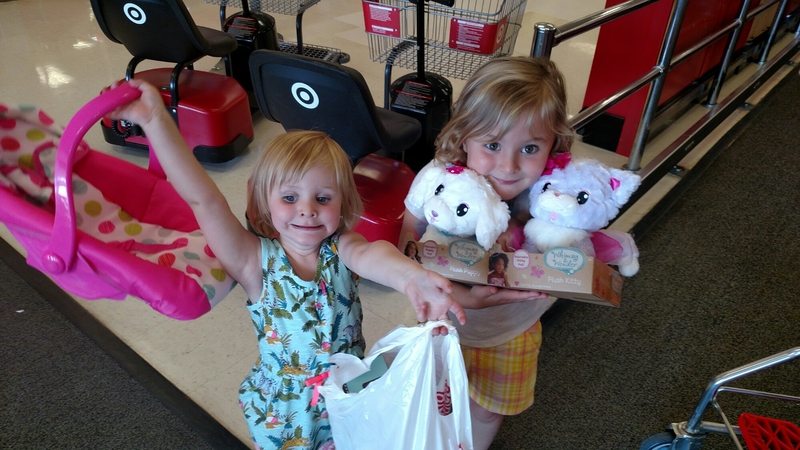 Caroline had it in her mind she wanted a specific kind of stuffed animal…and of course she found it…and it was in her budgeted money to get two of them, which she did. Caroline told no less than 5 strangers that “I fed a calf and sold it and I’m buying whatever I want with the money I didn’t put in the bank.” Thankfully, each stranger was very kind and told her that was great. I’m sure they will make up for it tomorrow!! Next If one member suffers, everyone suffers with it.